We’re joined by David Fernández from Guojing’s Spanish publisher, Pastel de Luna Editorial, which means “Mooncake” in English, to celebrate The Only Child - Hija Única – which is published today in Spain. Isabel Atherton: Hi David! We’re so happy to welcome you onto the site today. First of all can you tell us a little bit about your publishing house & the types of books you publish? DF: Hello and thanks Isabel! Our publishing house started as a result of three of our passions: illustration, literature and Eastern art. 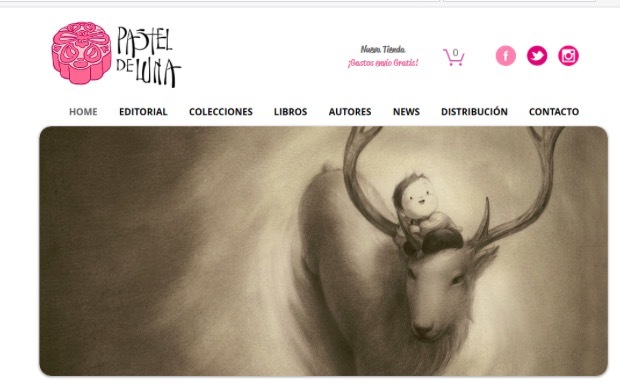 We are a young publishing house based in Madrid, and we publish illustrated books from Eastern Asia, mainly authors from Japan, China and South Korea. We decided to focus in the Far East because we love their culture, the way they see the world, their leisurely pace, the symbolism… and also because we are attracted by the unknown.  IA: We are thrilled you are publishing Guojing’s title – what made you want to publish The Only Child in Spain? DF: Well, It was like love at first sight. I came across this beautiful book looking though the internet. I only saw just a few images but it was enough to know I wanted to know more. First I was attracted by the magical illustrations, you can almost dive into them, and then, when I read the book, it was like an emotional rollercoaster. It left me with a very very nice feeling inside. As well as my colleagues, I was totally convinced of publishing it. 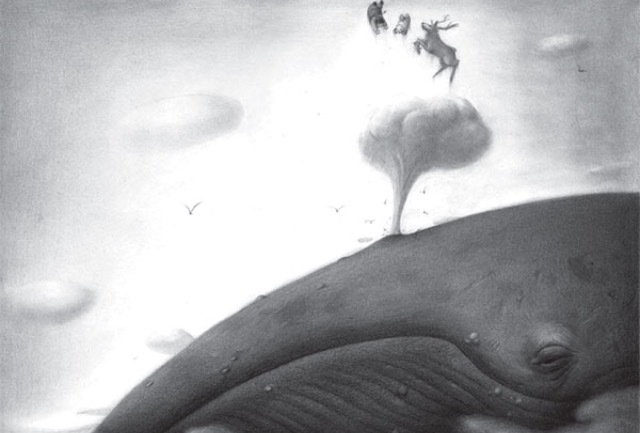 (We love the illustration Pastel de Luna chose from The Only Child for their homepage). IA: The book jacket is beautiful. We love the way the design flows across both sides of the jacket. 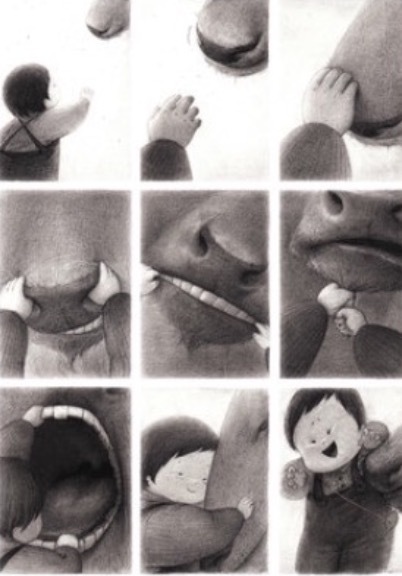 Most editions of The Only Child share the same cover image – what made this particular illustration from the book stand out to Pastel de Luna to want to use it as the cover image? DF: We talked with Guojing exploring the possibility of changing the cover and she was happy with the idea. So we asked her what illustrations she liked best for the Spanish cover and this was one of the three she chose. It was hard to decide but I think it was a good selection: the tender way the child is looking is so very expressive and makes the reader want to know what she is looking at. It’s a little mysterious. Also, the continuity of the design across both sides of the jacket is something we like a lot in our books. IA: It’s an incredibly striking image. Were there any other illustrations from the book that were considered before you settled on the final cover? DF: At first, we considered to leave it like the English edition. And then we chose between three images that Guojing also liked: the one we chose, another with the child embracing the deer’s head, which is so charming, and the one with the girl sitting on the head of the deer holding the horns with a happy face. Anyway, most of the illustrations from the inside could have been a great cover. IA: Which is your favorite spread in the book? Mine is the image of the enormous whale blowing the characters from out of its stomach into the sky. D.F. It is hard to choose. I think the one in which the girl is playing with the deer´s face: fingers on the nostrils, pulling the goatee, opening the mouth… I like those playful moments when we start to build confidence with a stranger. IA: Finally, what do you hope Pastel de Luna’s readers will take away from Hija Única when they read the book? DF: Especially the beauty. I am sure that when we experience the view of natural landscapes, we release endorphines, which reduce discomfort and elevates the feeling of goodness and wellbeing. I think readers can experience something similar with this book, thanks to its beauty. 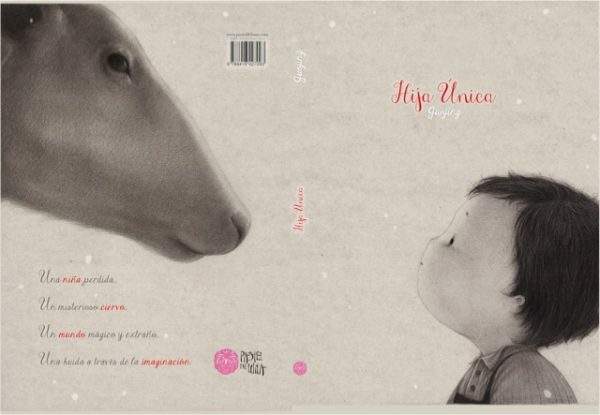 Hija Única – the Spanish language edition of The Only Child is out now and published by Pastel de Luna Editorial. It is available from bookstores and online.